... since I did the last inspection, and I figured it was time. This time I practiced with the smoker beforehand, I went over a game plan with John before I even opened it up, and then we went strictly by the guidelines and boundaries I set down for the whole thing, and it was really good. I'm realizing, the more I do this, the better it is to have an end in mind before I go in. There's no point in disturbing the girls unless I have a decision point to make, and I need to figure out what it is I'm going to do. 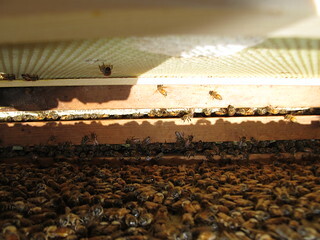 There are some books that say that in order to manage a hive properly, you need to go in every week. On the other side, there's several that say that every time you go in, you set them back by a week, and others that say that during good nectar flow in the summer you should never go in or you'll interrupt them badly. I don't think I did much interrupting today, and it was good to see how far the ladies have gotten in just the month I was away. 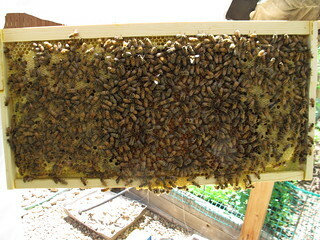 Before we left for China, I'd put a second deep box on top of the first, because the bees had already filled five of the eight frames, and I wanted to give them plenty of room while we were away. Unfortunately, I also knew that they have a tendency to want to go straight up from where they've already established brood or comb, so I needed to know if they'd spread out a little or had simply gone up. I think another reason I needed the very clear plan before I went in was because I'm still jet-lagged and kind of woozy during the day. Mental processes haven't been as clear or as clean since the trip, between the cold and the drastic time shift. I keep wanting to sleep during the day and waking up at night, even more so than usual, so I've been fighting all that, too. One of the things was just to get rid of the feeder, because while the sugar water was really good for getting the colony to build up its numbers, the bees were likely to take and store the sugar syrup instead of honey, and it just doesn't hold as well as actual nectar from flowers of all kinds. So I just took the whole top off, put the feeder out on the grass, and trusted that the two workers that were left in it would find their way home. 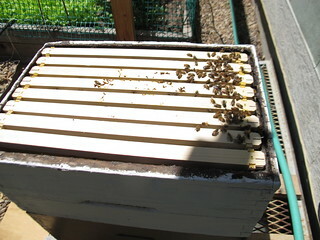 It's kind of fun to see the brand-new clean top edges of the new frames that I'd bought from the bee equipment place. Already loaded with foundation, I didn't have to worry about the evenness of how the foundations were built or set. 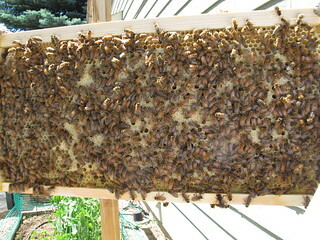 The first three frames were empty of everything but bees exploring their surfaces. The fourth was partially built on the right side, and the left was facing this particular frame, which is almost entirely built out! 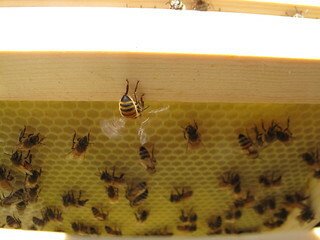 I was very happy to see this nearly filled with bees drawing out the wax. It's a clean side, with the wax nearly the same color as the foundation, and you can see through it, so no buildups from brood or anything, yet. It was interesting to see this frame in contrast to the center one and the ones on either side of that, which were filled with nearly complete brood. 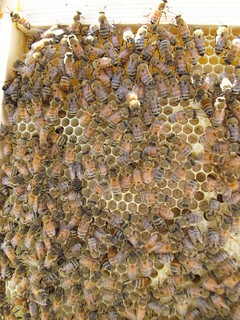 Since it's been about a month since I put this box on, if the Queen had gone directly for the first frame when I put it on, there was time enough for a whole round of baby bees to grow up (takes them 21 days to hatch, develop, morph, and break free to fly. They seem to be doing quite well, as there are so many of them, but one thing I really did notice was that they were becoming more and more the same. That the all-yellow or all-black workers that I'd started with just weren't there anymore. All the ladies are looking more like sisters, now, with the same pattern of stripes and the same brown fuzzy thoraxes. The dying workers are being tossed out the front door, too, and I'm seeing more and more of them piled up just off the edge of the entrance. They dry out into these abstract shapes of just the carapace and look almost like dried flower buds. The next frame was solid brood. Capped and ready to fly in a week or two. On both sides. There were just a few holes, and I wasn't exactly sure if these were cells that the Queen had missed or if she'd laid in them and these were the first bees to fly. Either way, they were pretty scattered and few, which meant that the mass of the cells had eggs laid in them. On the left, here, is one of the corners of the really crowded frames. It definitely reassured me that she was laying in nearly every cell she could reach, and just missed a few by mistake. It's just chock-full of pupae, who are about ready to be capped and let go to cocoon themselves and grow wings. So many of the workers were head-first into the cells they looked black. I had to study them pretty closely to see that they weren't a problem at all, and had a very good sense of what needed maintaining. The interesting thing was seeing that these frames were duller, more solid than the open, airy, uncapped frame where the light could just shine through. These were solid with developing bees. Then I saw this frame. Both sides were like this, where the center was empty, dark, and being cleaned out by the workers. The cell darkens after having held a pupae through larval stage and into adult. I hadn't seen any of this during the first inspection, of course, as they hadn't had the time to get that far. The amazing thing was knowing now that she's re-laying the frames, and putting eggs into used, cleaned cells the way she's supposed to, and that it's going quite well. None of the bees seemed particular disturbed by my moving things around, and no one was attacking me and none of them were particularly agitated by my observations. I hadn't crushed anyone, for all that there were a lot more bees in there. Counting the full frames, the estimates are about half a pound of workers per completely covered frame, so I have approximately six pounds of bees now, about doubling what I started with, even with the loss of all the old workers. As a parting shot... *laughs* This bee was fanning furiously, as it was a pretty hot day, and they simply can stand at the top of a frame to fan out the heat. There's a few ventilation holes in the boxes, now, and I'm offsetting them a little to improve air flow. There's also a steady supply of water outside and the top box has a few holes drilled into it. Given that the workers were starting to explore the frames to the side, and that they'd only really half-filled the boxes I'd given to them, I decided not to add a new super, yet, and let them just do what they were doing. I'm glad they are doing so well, and that your neighbors think it is cool -- apparently some people get really paranoid about having beehives in the neighborhood. I'm very grateful for that, too, as well... *bugs* and stinging bugs as well... but everyone's been really great, and we've invited anyone that wants to to come over and see them or just sit by the hive if they like. And this fall I hope to have honey to hand out to everyone who has been amazing. Not a lot of people have taken us up on it, but I loved one friend of mine standing right in the middle of the flight path going, "They're bouncing off of me!" These are Such Awesome photos and explanations! *laughs* I'm very glad that you're enjoying these!! We noticed a lot more bees than usual when our holly and nandinas were in flower a few weeks ago - they were absolutely covered in honeybees most of the day, even in the rain. Unfortunately, we also seem to be looking at a banner year for mosquitoes - I've seen more in the house already (and we've had the AC on for weeks) than I normally would all year! Of course all the rain we've been getting hasn't helped - we got so much in the storm Friday our little town got mentioned on The Weather Channel! So you have the one hive, and it has one queen and multiple layers? How much honey will you extract on average from that a year? The Mr. and I need to do a huge amount of landscape revision on this lot (what was already here was ghastly, and I'll admit we've allowed it to get worse because we basically hated 90% of it.). I've been trying to steer him towards as many things we can find for new plantings (we need lots of trees, hedges, perennials, everything) that will eventually yield us sustenance of some kind - he's on board, as long as none of it is too high maintenance. So I've been researching low-maintenance edible landscaping. I wish we could have some chickens and a dairy goat or two, but I suspect we're zoned against such things. I could probably get away with bees (I think I'd enjoy it) but I just this second remembered Mr. Hg is allergic, dammit. I was fussing at him for not having an epi-pen handy for when he's doing yard work (we've also got some nasty wasps &hornets.) So I guess a hive is out, too. :( I love hearing about yours, though! One queen, multiple boxes with lots of frames in each box. Yes! I don't know how much honey I'll get! I have no idea, as I haven't gotten that far before. Ooo... sounds like a major redo of your landscaping... chickens are allowed here! 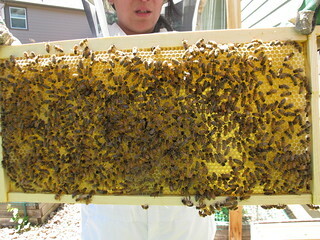 Just hens, and six or less, and they were allowed the same time two beehives were allowed per house in Boulder County! So that's been nice.